Flipkart Offering The Freedom Sale on 10th, 11th and 12th August. Huge Discounts, Deals, and cashback offers. Feel The Freedom of choice on the best of offers with Flipkart “The Freedom Sale” from 10th-12th August & Also enjoy additional offer by HDFC bank for its users. Keep visiting CoupenYaari, Happy Shopping. Sneak Peek Choice of Offers, for three hours only starts on August 8, 6PM-9PM. Offer is not applicable on LeTV range of televisions & on LYF Flame 8 phones. 8th August: Sneak Peak 6PM to 9PM. 9th August: Early Access 6PM to 11.59PM. 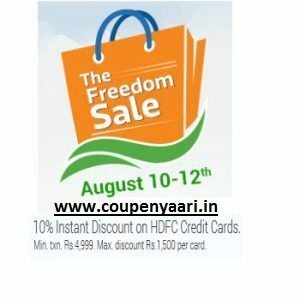 10th to 12th August Flipkart Freedom Sale. How to Buy Product in Flikart The Freedom Sale online?